FOREST GROVE — It's early, but that was a big game. 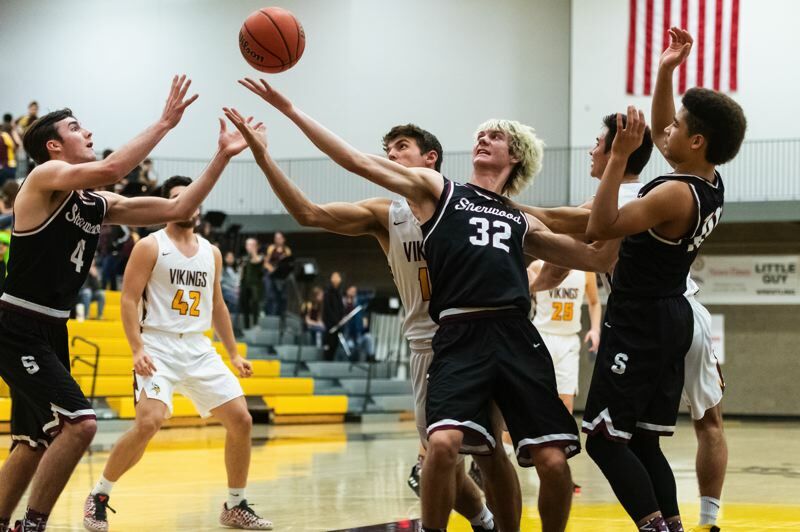 The Forest Grove and Sherwood boys basketball teams battled for four quarters, but in the end, despite a key early injury, the Bowmen outlasted the Vikings for a 59-55 victory in a Pacific Conference game played Friday in front of a raucous crowd at Forest Grove High School. 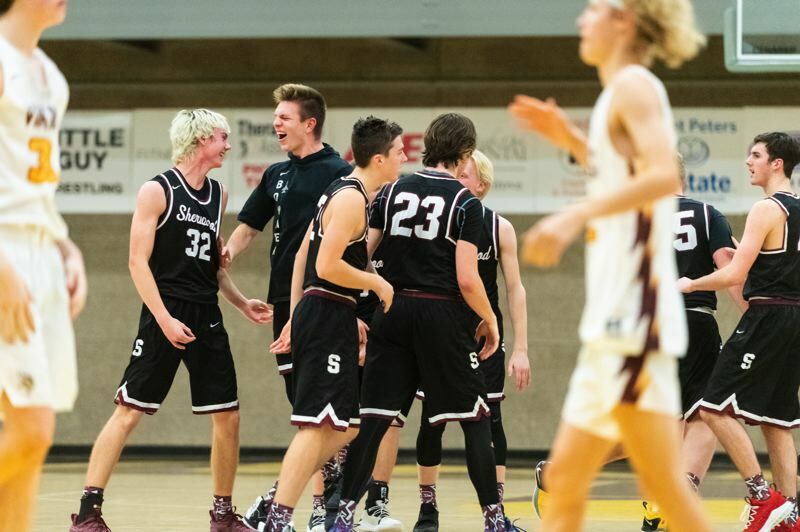 With the win, Sherwood improved to 2-0 in Pacific Conference play (11-4 overall), putting the Bowmen in a tie with Century for first place in the conference standings. Forest Grove moved to 1-1 in Conference games, and to 11-3 on the season. "I felt like throughout the game, they got the bulk of those 50-50 balls," said Sherwood head coach Rahim Tufts. "They were a little tougher and more physical than us, so over that last few minutes, our focus was to win those balls, be more physical, be tougher, and I feel like we did that. We got in the passing lanes, got some deflections, got some stops, and every single person was rebounding and boxing out." With Sherwood leading 56-55 with less than four seconds on the clock, Bowmen junior Blake Jensen was at the free throw line shooting two. The 6-foot-6 post made the first, but then with the rest of his team on the other end of the floor preparing to defend the Vikings' final effort, Jensen missed the second, but managed to grab the rebound and finish a whirlybird put-back in the final seconds to seal what was a mammoth road win for the visitors. "That was crazy," Jensen said. "I knew it was coming off, so I figured I might as well crash. We didn't have any guys down there blocking out, so they probably didn't think they needed to block out, and I was able to get to it." 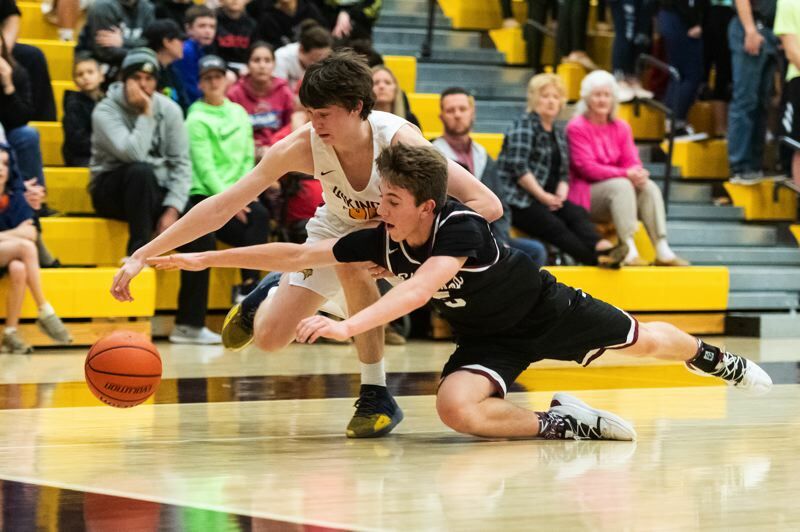 Forest Grove head coach Greg Evers wasn't as amused by it, but even in defeat, he appreciated the night as whole opposed to looking only at the end. Forest Grove was led by sophomore Braden Hudgins who finished the night with 22 points and four rebounds, including five 3-pointers. Sherwood jumped-out to an early 8-3 lead thanks to the hot hand of senior Tyler Hix, who made two three-pointers in the first two minutes. The Bowmen rode that wave to a 17-10 lead after one quarter, then made it 20-10 to start the second when senior captain Braden Thorn immediately hit a 3-pointer at the outset. Shortly thereafter, Thorn left the game with an apparent ankle injury, and the Vikings wasted little time taking advantage of his absence. Hudgins hit three consecutive threes to cut the lead to five, then following a fourth three by teammate Adison Emerick, senior Henry Tonges tied the game with a thunderous one-handed dunk that brought the Vikings faithful to their feet. The Bowmen took a 31-30 lead to the half, then the two teams traded blows like a couple of heavyweight prize fighters throughout the third quarter, with Forest Grove using a late run sparked by standout point guard Guy Littlefield to take a 48-43 lead, before Hix nailed a 25-foot buzzer-beater to cut the lead to two heading to the fourth quarter. Hudgins opened the fourth quarter with a basket to put the Vikings ahead 50-46, but a quick score by Jensen followed by another Hix three put the Bowmen back in front. That one-point lead became four shortly thereafter when Jensen completed a three-point play the old-fashioned way. 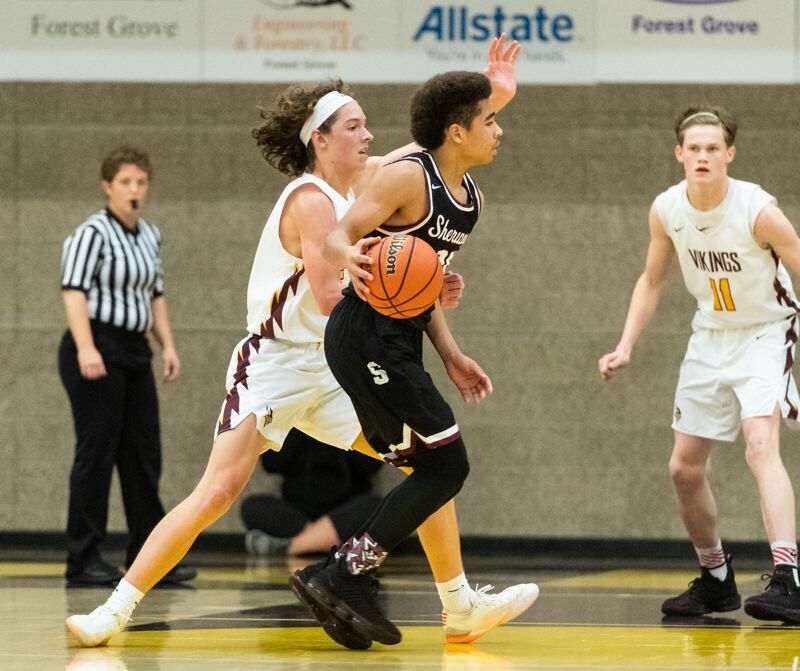 Emerick hit pay dirt from beyond the arc on Forest Grove's next trip down, then Hudgins gave the Viks back the lead, 55-54, with a point-blank finish with just over two minutes left on the clock. 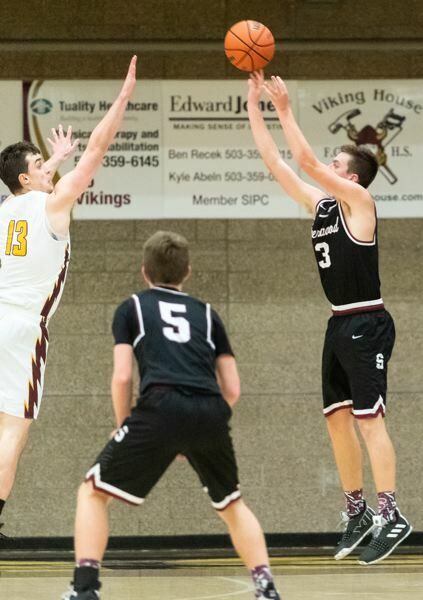 Unfortunately, however, for the Viks, Sherwood sophomore Asher Krauel took back the lead with a basket with 1:49 left. Over the next minute of play, neither team could muster much offensively, and Sherwood missed a couple golden opportunities to seal the deal at the free throw line — but Forest Grove missed two quality looks at 3-pointers inside of 30 seconds, setting up Jensen's free throws and ending what was, for all intents and purposes, a pretty darn good Pacific Conference battle. And Sherwood was delighted with the road win. "Forest Grove is really well-coached, they shot it well, and they execute their stuff really well," said Tufts. "One of our best players went down with an injury, and we told the guys every game is a dogfight in league play, and to get one on the road feels really good." Thorn probably summed it up best for the Bowmen. Sherwood was led by Hix, who finished with 16 points, while Jensen tallied 10 points and six boards, Krauel had eight points, and senior Charlie Bulfinch added eight points and five rebounds. Sherwood will be back in action on Tuesday, when it hosts McMinnville in a Pacific Conference game starting at 7 p.m. at Sherwood High School.